Covering 2m and 70cm, the ID-51 can also receive FM broadcasts and AM short wave radio. It supports D-Star (of course) as well as FM mode, and boasts a large 128x104 pixels display, the largest yet seen on an amateur radio handheld rig. Like its smaller sibling the UHF-only ID-31, the ID-51A/E has a built-in GPS which can be used for track logging to a micro-SD card. The storage card can also be used to record incoming and outgoing voice traffic. Very useful - not! 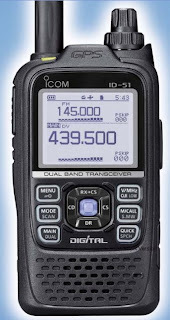 Disappointingly though not unexpectedly, this new Icom does not support APRS, though it presumably supports D-Star's rather lame version, D-PRS. The ID-51 is being billed as the most technically advanced handheld, though it looks like you will be paying a lot for features - like the GPS and short wave receiver - for which most hams will have little use. I doubt that the large display - never mind the GPS - will do much to extend battery life, though Icom will offer an extended battery pack (at the usual inflated Icom prices no doubt.) However it is nice to see a manufacturer breaking the mould for HT user interfaces which have changed little for the last 20 years. Good evening Julian, I agree and have wondered the same for a long time...and that is GPS and short wave...can't figure that one out. Most of us have a good GPS in the car and as for short wave well get a good receiver for that. Oh Julian...if you would only give up the fight and embrace DSTAR...the wonderful utility of GPS and the other features of this radio would make you smile broadly! How about popping into any area on holiday only to have your ID-51 give you a list of all nearby DSTAR repeaters....don't even have to put in a callsign, just choose one, hit "enter" and have a lovely chat with a local, and be able to tell exactly how far he/she is away from you and in what direction. Or call up your new pal on Guam for a chat and tell him how many km. And when things get quiet, put on some music or a football until your pal chimes in and the radio mutes the music/football. Nifty, as we say. Thanks for your wonderful website...and best wishes from Santa Monica.